A few years ago some very sharp marketing professionals noticed that our planet is inhabited chiefly by global teenagers. Almost half the people presently living on Earth are under the age of 20! These billions of kids listen at the same music, wear the same fashions, watch the same movies, and learn the same objects in school. What is cool in Barcelona is cool in Berkeley, and in Rio. Marketing experts can measure the global mind of teenagers in dollar sales of albums, jeans and videos. The harmony of the global teenager mind is so reliable that multinational corporations can recycle the same advertisements to kids around the world with only minor modifications country to country. Priestly mystic Teilhard de Chardin, who forsaw the emerging global mind in spiritual terms, would habe been dumbfounded that it should first spawn in the materialistic world of teenagers. This version of global mind - a world-wide unity of similar thoughts and similar values in people - flows from the recent convergence of dense telecommunications, accessible satellite TV, significant planetary trade, and easy international travel. But while this family-of-man blossoms, it is only one minor aspect of something much larger, more powerful, and more problematic. As the global mind evolves, it will not be a huge human mind, nor even a huge mind of humans, anymore than a human mind is a tissue mind - or a large mind of tissues. Marvin Minsky has shown quite clearly that a mind is composed of many varieties of interacting non-intelligent agents. Out of this society of dumb parts, a whole intelligence emerges. The intelligence does not reside in any single part, or even the sum of the parts, but emerges quite distinct in character from the parts. The global mind will not be humanlike. Even if the global mind depended solely on a collective 6 billion human minds, the resulting mind would be unhumanlike in its perspective and values. Its scale transcends the interests of a single human being. Very likely a global mind composed exclusively of human intelligence would not value human life as much as individual humans do. But as it turns out, human minds will constitute only a small part of the global mind. Networks of computers in the millions, telephone switching stations by the thousands, data banks by the dozens, and a hundred TV networks watching the world, in addition to billions of human brains, all constitute the society of sub-minds making up the global mind. These machines will shape the emerging character of its consciousness. No part of a brain can be aware of the whole mind's thought. Likewise, no part of the global brain can be aware of what the global mind is thinking. We humans will be unconscious of what the global mind ponders. While we can examine its behaviour, we can only guess at its reasoning. The thoughts of the global mind - and its subsequent actions - will be out of our reach and beyond our understanding. Our primary difficulty in comprehending the global mind is that its cognition will be of a different sort than either mammalian or artificial intelligences. The planetary scale of a global mind allows large, long-cycling thoughts that may be so slow as to resemble objects. Evolution in nature is a type of global biological mind, one that searches the world for solutions to the problem of fitness. Its slow thoughts are organisms - verbs that change so slowly they seem to be nouns to us. Thoughts of a man-made global mind will be equally foreign to our conception. More troublesome for us is the consequence that any mind is largely unaware of its internal work. Human minds are deliberately kept in the dark of their own deeper processing because of the way in which minds evolve incrementally from primitive proto-minds, and to protect the mind from its own curious meddling. The global mind, too, will be largely unconscious of its own processes. Not only will humans be in the dark about its mental states, but the global mind itself cannot fathom what it does. Although humankind will be an integral member of the global mind, this consciousness will be unlike us and entirely out of our control. A mind spins its wheels fruitlessly unless it is embodied. The body of a mind must have sensory input and some way to manifest its thoughts as action or output. The global mind is only now acquiring a body. As TV signals become digital, the global mind acquires eyes. As data banks fill up with textual knowledge, it gains verbal skills. As factory robots feed on signals from sales offices, the mind acquires hands. The action of the global mind will be upon our manufactured environment, by altering and creating things. One of the first thoughts of the global mind is the computer virus - a replicating idea which will forevermore be with us on Earth. Formost on the agenda of the global mind is the prime challenge all organisms face: how to ensure its survival. The global mind will not retreat once born. We humans are busily midwifing the global mind's birth by connecting everything we've made to everything else. The question I have been asking myself is "What happens when you connect everything to everything?" The answer, I believe, is you get the Net. And the Net gives you the possibility of adaptation, learning, evolution, and mind. Connecting everything in a global Net gives you global learning, global evolution and global mind. Without the Net, those qualities cannot emerge, nor will the Net always sprout them. My research has been a quest for the varying conditions needed for the Net to hatch adaptation, learning and evolution. How do you build a Net that will learn and improve? The Net is the net of telecommunications, of course, but also the net of economics, genes, ecologies, circuits, brains, and societies. All that we find most interesting and unpredictable in its novelty takes the form of the Net. The ways of the Net have been uncharted until recently. Even the mathematics needed to understand these complex neatworks is only now being created. This new breed of math is a tricky job. The math must describe an uncountable number of units acting upon each other in a massively circular way. What A does depends on what B, C and D do, and what B, C, D do depends on what A does. The only way to know what happens is to calculate all the codependent changes at once. In the technical literature, this style of complex, parallel computation is being pioneered as cellular automata, Boolean networks, neural nets, spin glasses, and classifier systems. I call them Net Math. And I crown the era of these reticular (networked) systems, the Age of the Net. The Atom is the icon of 20th century science. The symbolic Atom is unclothed: a black dot encircled by the hairline orbits of several other dots. The images of the planetary Atom is at printed on toys, and baseball caps, and works its way into corporate logos and government seals. It appears on the back of cereal boxes, in school books, and stars in TV commercials. The Atom stands for power and knowledge. It is as dependable as a circle, as regular as round. The Atom whirls alone, the epitome of singleness, the metaphor for individuality. It is the irreducible seat of strength. It mirrors the cosmos, at once a law-abiding solar system of energy, and at the same time the concentric heavenly spheres spinning from the galaxy on down. In the center is the animus, the It, the life force, holding all to their appropiate whirling station. The symbolic Atom's sure orbits and definite spaces between them represents the understanding of the universe made known. It is a symbol of certainty, and conveys the naked power of simplicity. The symbol of the next century's science is the dynamical Net. The Net icon has no center - a bunch of dots connected to other dots - a cobweb of arrows pouring into each other, squirming together like a nest of snakes, the restless image fading at indeterminate edges. The Net is the archetype - always the same picture - displayed to represent all circuits, all intelligence, all interdependence, all things economic and social and ecological, all communications, all democracy, all groups, all large systems. The icon is slippery, ensnaring the unwary in its paradox of: no beginning, no end, no center. Or, all beginning, all end, pure center. It is related to the Knot. Buried in apparent disorder is a winding truth. Unravelling it requires heroism. The Net is an emblem of multiples. Out of it comes swarm being. It is unredeemably social, unabashedly of many minds. It conveys the logic both of Computer and of Nature - which in turn convey a power not understood. Hidden in the Net is the mystery of the Invisible Hand - control without authority. Whereas the Atom represents clean simplicity, the Net channels the messy power of complexity. The Net, as a banner, is harder to live with. It is the banner of non-control. It signifies the swamp of psyche, the tangle of life, the mob needed for intelligence. The Net is the icon of the global mind. The global mind is the union of computer and nature - of telephones and human brains and more - and it is a complexity of indeterminate shape governed by an invisible hand of its own. What little we can learn of the global mind's consciousness, we begin by employing Net Math and the insights won in study of other complex systems. Learning to understand the global mind of which we are both part of and part creating, is only secondary. The chief task in the next fifty years will be learning to let it go. 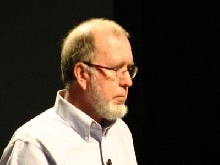 Kevin Kelly iwas chief editor of WIRED and Whole Earth Review, a journal of unorthodox technical and cultural news.